I worry when I hear schools talking about their (often new) technology, and simply describe the tools (word processors, blogs, social networks, apps, etc.) that they are teaching their students to use. And I fear that they have wasted their money, because they have totally missed the point about technology's role (and potential!) in school. The true value of technology lies not in learning to use the technology, but in using the technology to learn. Early on in MLTI, Maine's 13 year old statewide, middle grades 1to1 initiative, there was a discussion about the focus of our PD. Should we have workshops on spreadsheets, for example. But we decided, instead, that we would do a data collection and analysis session, and participants would leave also knowing how to use spreadsheets. After all, why bother creating spreadsheets? Certainly not just for the sake of creating spreadsheets. They are a tool in service to some other purpose. As an aside, I have heard some make the “prerequisite argument,” that is, the need to learn spreadsheet creation in order to be able to analyze data. But that's using logic when we should be applying psychology. Because the irony is that people learn better, understand better, can apply better, and remember longer skills they learn in the context of some immediate, authentic need, rather than in the absence of any context other than the abstract (and uncertain) “you'll need it in the future.” I have had to reteach too many lessons when the students now had an actual need to know, that I had already taught once “in case” they needed to know in the future… How'd that work for me? “Need” first, “tool” second, not the other way around. 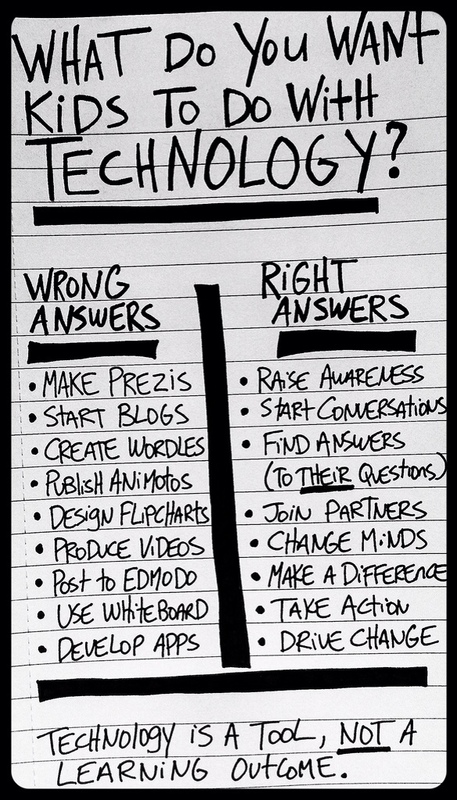 So I am thankful to kindred spirits, such as the author of Technology Is a Tool, Not a Learning Outcome, (and is credited with the image in this post) who also work to insure that we focus on the right thing when we bring technology into our schools. This entry was posted in Technology for Learning, Uncategorized and tagged ECE_iPads, Ineffective Motivators on December 2, 2013 by Mike Muir.